wherever you are, just Be. Going to the Evergreen State Fair has been a tradition in our family since as long as I can remember. I started taking Campbell when she was old enough to ride the rides with me in Kid land, but this year was much different as she wanted nothing to do with that part of the fair. She led me straight to the big kid rides and wanted to go on them all. I brought along one of our employees daughters, Lizzie, who is 8 years old and she and Campbell got along great. I got wristbands for all 3 of us but I only went on a few rides. I just can't do it anymore. They make me so nauseaus. Campbell is a little dare devil and she loves all the rides and laughs and has her arms up the whole time! We had a great time though and although the weather looked questionable all day, it never rained. Well I finally got to head over to Ellensburg this weekend, with no racing, a nice weekend off. I got to Becca & Justin's and we started organizing Dailey and the new babies rooms. Rachel had taken Dailey and her brothers Logan & Landon to Cle Elum for a Farmers Insurance BBQ so it was quiet at Becca's. That is until we got a phone call around 3:30 that Landon had broken his leg and it was not good. Becca & I hurried down to Cle Elum to try and help Rachel out since she had all 3 kids by herself. The boys had been playing football and Landon and Logan had gotten tangled and in the process, Landon broke his leg. Rachel got him to the Urgent Care Clinic in Cle Elum and then they transported him by ambulance to the Ellensburg hospital. Luckily there was a surgeon that was able to help Landon so they didn't have to take him over to Seattle. I drove Becca's car back to her house, she drove her moms with Logan and then Rachel had Dailey and we all met at Becca's to drop Dailey and Logan off with Justin. Rachel, Becca & I headed to the hospital to meet Landon and Pam. They x-ray ed him and said that the bones were both broke in his lower leg, but above his growth plate. They put him completely out in case they weren't able to reset the leg by just putting the cast on which may have resulted in surgery and pins being put in, but luckily that didn't need to happen. They set the leg with a cast that goes from his upper thigh, all the way to his toes. Poor Landon :( He is only 8 years old, and he and Logan are definitely boys in every sense of the word! Becca asked Pam if he was sad or hurting during the ambulance ride and Landon said that he was just mad because he didn't want to break his leg that day..poor kid. He and Logan both have a great sense of humor and imaginations and Logan was a very good big brother trying to help him and get him some things at the store to occupy his time. Landon was finally released from the hospital around 10pm Saturday night and they took him home. Rachel and I got up early Sunday morning and went to Fred Meyers to get Landon a new X Box game and some of his favorite treats and then we headed over to see him. Both of the boys were very excited that Rachel had brought over the X Box and even a new game. Landon was propped up in a chair with his leg elevated but his toes were pretty purple. He had a rough day yesterday since the cast was itching him and his heel was hurting but when we went there last night to visit him, he was doing much better and his toes looked good. He said he was in no pain so that was great to hear. After leaving Landon yesterday morning, Rachel and I went over to Becca's to see Dailey. When we arrived she was in the garage working with Justin in her diaper and rain boots. She is so cute! Rachel took her inside to change her diaper and decided to give her a bath too so she played around in the tub for awhile and then Rachel french braided her hair. We had lunch and hung out there for awhile and then Rachel and I headed back to her house. I always have a great time in Ellensburg no matter what we do and I can't wait to go back this weekend for the Rodeo/Fair/Races and maybe even the arrival of Baby Seth! 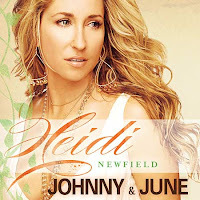 What I've been up to..
Heidi Newfield, former lead singer of the band "Trick Pony". I loved them as a group and I love her as a solo artist. She has a great voice and from the first time I heard her hit song "Johnny & June" I knew I would love her new cd "What have I been waiting for". It's pretty much been the only thing playing on the Ipod. Last week was the season finale, but tonight there is one final behind-the-scenes episode, of a vacation they took as a family. I'm so excited for it! A couple Sunday's ago, Shelby and I met at Paper Source in Bellevue to pick out the materials for her & Jeff's wedding invitations. Since then, I have been busy looking through samples and ideas online, looking at wording samples, font samples..you name it. I love wedding stuff so this is all fun to me. 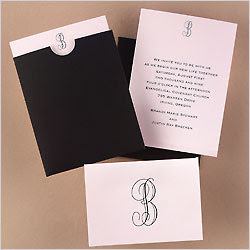 I just need to hurry up and make some final choices for them to choose from and I will be an invitation makin machine! I have 1 month to get these done, so the pressure is on. Well as of last night, Miss Cadence is now 3 months old. Where have those 3 months gone? It doesn't seem possible. She changes so much every time I see her which is fairly often. Last night when I got to their house, she was sitting up like a big girl and her big brown eyes were so alert and looking around. Her arms and legs were flailing around and she wouldn't sit still. She doesn't like to lay down anymore because she likes to have her head up to be able to see everything going on. This cracked us up. Shae put her in her swing with her binky in her mouth and then Shae came and sat on the couch. We looked over a few seconds later and Shae thought she was trying to get her binky back in her mouth because her head was buried, but she had already fallen asleep! It was so funny, she must have been one tired girl. We put her in her highchair last night at dinner and it was so cute to see her in that big chair. She was happy just watching us eat and looking around. It was bath time last night and she just loves the bath. She was splashing like crazy and just wanted to sit up. Shae made some funny hair do's for her, including the Alfalfa look :) She is so cute and getting so big, it is so fun to watch her grow. 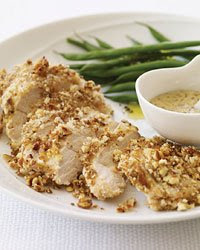 While reading Food & Wine Magazine the other day, I came across a recipe for Mustard Baked Chicken with a pretzel crust. I'm not a big fan of mustard, but I'm always looking for new ways to cook chicken and something about this sounded good so I decided to try it. It was delicious and healthy too. It is such a simple recipe and doesnt take too long to cook, a great week night recipe that I will definitely make again. Preheat the oven to 400°. In a food processor, pulse the pretzels until coarsely ground; you should have coarse chunks and fine crumbs. Transfer to a large, shallow bowl. Wipe out the food processor. Add the oil, whole-grain and Dijon mustards, water and vinegar and process until smooth. Season the dressing with salt and pepper. Pour half of the dressing into a large shallow bowl, add the chicken breasts and turn to coat. Dredge the chicken in the pretzel crumbs and transfer to a rack set over a rimmed baking sheet. Bake in the upper third of the oven for 20 to 25 minutes, or until cooked through. Slice the chicken and serve warm or at room temperature with the remaining mustard dressing. *Note, I didn't exactly follow the steps. I just coated the chicken with spicy brown mustard, rolled it in the pretzels and then placed it in a glass dish that I had sprayed with Pam. I baked it for 25 minutes and it was perfect. Every Tuesday night at 10pm for the past several weeks, I have been glued to my TV watching "Tori & Dean - Home sweet Hollywood". I don't know why I love it so much but I just do. I am not a huge Tori Spelling fan, I never watched 90210 and I haven't been a fan of her TV movies. But something about reality TV and watching peoples life's, gets my attention. I bought her new book, Stori Telling, and read it in about 3 days. They actually lead a pretty interesting life and are great parents from what I can tell. Sometimes I think that she thinks she has way more celebrity status than she does. For example on one episode, she went to order a cake for her sons 1st birthday party, and there was 1 paparazzi outside. She was like "oh no, the paparazzi is here". I was thinking, it's only 1, it's not like there is 20 of them. But I guess that's how she has been raised. She does get on my nerves but for some reason, I still tune in every Tuesday to watch "T"! The Idaho 200 is another big event that always attracts some big names to come out and play and this year was no different. Jay was going to race, then he wasn't and then Wednesday morning they were..typical race team :) We met at The Saul's at 5:30 Friday night, loaded in the hauler and headed to Stateline, ID. about a 5 hour drive. Saturday Jay had practice and then qualifying and then a race with the RMCS. 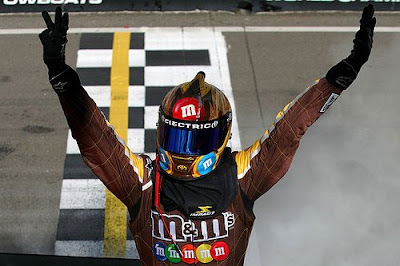 If he finished in the top 6 of that race, he was guaranteed a spot for Sunday's 200 lapper. He qualified 3rd for Saturday night's race and with the 20 car invert, started 17th. He had a great car and worked his way up, passing each car on the outside. It was so good to see his car working so good! Until about lap 50 when he had just passed a car for 5th place and that car decided to wreck him in turn 3, causing a mini pile up that included a few more cars tagging him. It was not a pretty site and he was done for the night. They worked on the car until 1:30am when we finally got kicked out of the pits. The guys were back at the track at 8:00am to work on the car some more. It was taped and riveted everywhere. Since he didn't finish Saturday nights race, he had to qualify his way in. He practiced a little Sunday morning and said the car was still really good. He went out mid pack to qualify and when all was said and done, he was 2nd fast time so he would start 11th in the race due to the invert. He had a great car Sunday but unfortunately a wreck caused by a lapped car, bunched everyone up. Jay had got through the wreck, but the guy behind him hadn't slowed down enough and jumped his left quarter panel. It was a bit scary as he drove over the window net. Jay was okay but the car was not, and once again the day was over. That wreck took out several good cars which was so unfortunate. Inspiration. Quotes. Creating. Children. Laughter. Cooking. Family. Scrapbooking. Crafting. Travelling. Racing. Life. Love. Lessons. Friendship. Passion. Helping. Listening. Loving. Fun. Happiness. Reading. Just some of the things you will read about here as I live my life day by day. "We do not know the true value of our moments until they have undergone the test of memory." "Three grand essentials to happiness in this life are something to do, something to love, and something to hope for." "You have to pick the places you don't walk away from." Where I spend my time.